This undated photo provided by the Laguna Beach Police Department shows their newly decorated Police SUV patrol vehicles in Laguna Beach, Calif. Some feel the design is too aggressive while others can't believe anyone would object to the American flag. 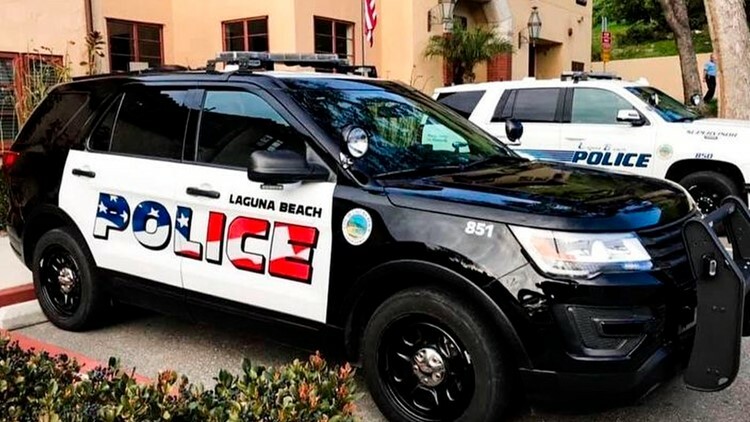 An American flag design that's been added to a handful of freshly painted Laguna Beach police cars is dividing residents, the Los Angeles Times reported on Saturday. The city council in the small Southern California coastal city is planning to discuss Tuesday whether to keep the new stars and stripes logo within the word "police" or to choose an alternative. According to the Los Angeles Times, some residents felt the flag design was too aggressive while others were shocked that anyone would object to the flag. Artist Carrie Woodburn said at a March council meeting that it was "shocking to see the boldness of the design" when the newly painted Ford Explorers hit the streets. The city council agreed in February to repaint its all-white squad cars in black and white with the image of a flag through the word "police" on the side. According to the Los Angeles Times, the graphic the council unanimously approved in February was a more muted version of what wound up being put on the vehicles. At the time, the Laguna Beach city manager said the design featured a "cloud-like look." But not everyone thinks the flag design should be changed. Attorney Jennifer Welsh Zeiter said she found the look "exceptional" and questioned who could object to the display. She argued that critics are so blinded by their hatred of President Donald Trump, "they cannot see through their current biases to realize that a police vehicle with the American flag is the ultimate American expression." The president of the Laguna Beach Police Employees Association, Cpl. Ryan Hotchkiss, said he's only received positive feedback about the new look. Of the department's 11 vehicles, seven have the updated design, police Sgt. Jim Cota told the Los Angeles Times.